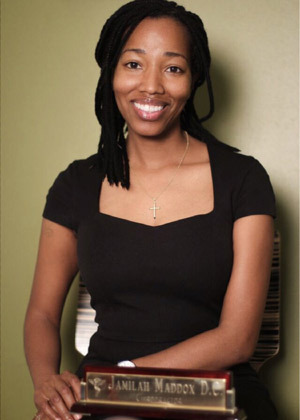 Dr. Jamila K. Maddox is a World Citizen – born in Cincinnati, Ohio and nurtured in numerous US states, Europe and Africa. Her family, friends, associates and patients are from all over the world. Since 2010, Dr. Maddox has delivered high-quality health care to area residents wishing to eliminate their pain and optimize their wellness potential. At Cincinnati Healing Arts we welcome all individuals and family members and offer a holistic approach to health care, including Mindfulness Medicine, Chiropractic Health Care, Personal Injury Care and Functional Nutrition. Dr. Maddox received her Doctor of Chiropractic degree from Palmer College of Chiropractic in Davenport, Iowa. She feels fortunate to have grown up in a family that embraced natural health care. Common Maddox family practices included: meditation; preparing and eating healthy meals; maintaining active lifestyles and going to the chiropractor. This regimen transformed my body and reduced my stress response dramatically. When Dr. Maddox isn’t busy taking care of her many patients, she enjoys preparing healthy meals, working out at LA Fitness and running 10K and 5Ks in the Flying Pig Marathon and Queen City Foundation races. She encourages people to “Eat, Move and Think Well 365″ with her mini workouts, whole food meals and smoothie pictures and witty social media posts. Dr. Maddox displays unique art in her wellness studio and finds several gems at Joseph Clark Gallery- Arts of Africa. She’s a participating member of the Ohio State Chiropractic Association and Greater Cincinnati Northern Kentucky African American Chamber of Commerce. Dr. Maddox is an avid reader and immerses herself in daily mindfulness practices, including meditation, prayer, affirmations and positive visualization. She live-streams church services at Agape Live International Spiritual Center and is an active member in a small group. We encourage you to take the time and effort to invest in your well-being. We care deeply about our patients and try to provide an oasis of comfort and compassion to all those we serve. Learn more about becoming a new patient or contact us today for a free consultation at our Cincinnati practice; we’re open late!